Online education degrees prepare graduates for a career in teaching. Regardless of whether you want to pursue a theoretically-based program like educational studies or a more traditional elementary or secondary education program, you'll find a variety of opportunities online. For many students, finding an affordable online education degree is critical to their decision-making process. Distance programs are often less expensive than traditional campus-based degrees, and you'll be able to find a rigorous program at an affordable price. While it's tempting to look for the cheapest online teaching degrees available, in the long run, it's more important to invest in an affordable online teaching degree that delivers value and doesn't compromise on academic quality. 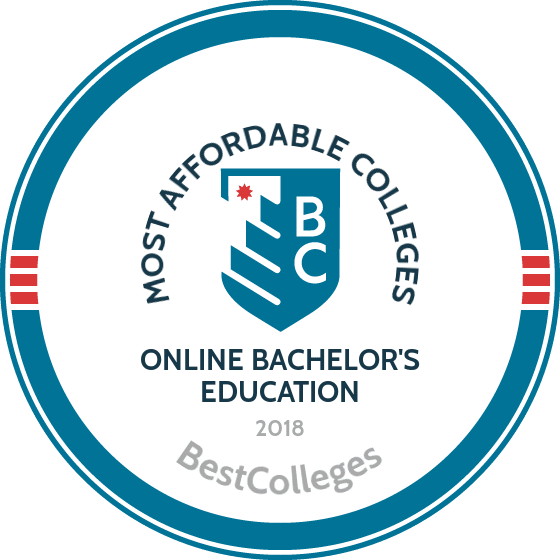 Below, we've ranked the 25 most affordable online bachelor's of education programs in the country. Using our College Affordability Score -- a holistic metric that weighs academic quality, affordability, future earning potential, and other factors -- we've identified the education programs that offer the most bang for your buck. If you're looking to obtain an online teaching degree, be sure to start your research by taking a look at these top programs. WGU offers affordable online teaching degrees that each lead to licensure. Students earn BA degrees in various fields, including elementary education, special education, mathematics, science, chemistry, physicals, biological science, and geosciences. The programs welcome students with all levels of college experience. Freshman complete the 120-credit programs in four years. Applicants should submit high school or college transcripts. Standardized test scores are not required. Prospective students must attend an admissions interview with a counselor, and education students receive a background check. All students pay the same low tuition regardless of state residency; WGU has not raised tuition since 2008. Bellevue offers an affordable teaching degree online program that prepares graduates to work with adult learners. The 127-credit BS in adult education is delivered entirely online using a cohort model; students learn from each other’s professional and personal experiences. The program emphasizes applied, hands-on learning to prepare students for teaching careers. Students take 40 credits of major courses, 36 credits of general core, 42 credits of electives, and a 9-credit exploration of American freedoms, tradition, and vision. Applicants should submit high school transcripts or a GED certificate. Online students pay the same low per-credit tuition rate as on-campus students, regardless of state residency. Graduates who’ve earned BU’s bachelor’s of arts in liberal studies with an emphasis in multiple subjects teaching are prepared to enter post-baccalaureate credentialing programs or to pursue instructional positions at public, private, or charter elementary schools. The 51-credit program explores child development, incorporating subjects such as language arts, mathematics, visual arts, human development, health, and physical education. This online teaching program is designed for transfer applicants who have completed at least 12 college credits. Applicants must submit transcripts from regionally accredited institutions. Active military personnel may transfer credit from the Community College of the Air Force, SMART, AARTS, or JST. All students pay the same affordable tuition rate, regardless of state residency. Further discounts are available for military students. Park offers an online teaching degree to prepare future educators to work with young children. The BSE in education studies offers four areas of emphasis: young child, youth, early childhood education and leadership, and early childhood education teaching young children. This program does not lead to teaching certification. Of the 120 required credit hours, at least 57 must be major credits. Students must maintain a 2.5 cumulative GPA. Applicants must have completed 60 prior credits and must hold a cumulative high school or college GPA of 2.75. Freshman applicants must also submit ACT scores. All students pay the same per-credit tuition regardless of state residence, and military students receive a discount. Future educators earn an affordable education degree at UNC Wilmington. Classes in the BA in elementary education program are taught by experienced online educators. While the degree prepares students to teach any K–6 subject, concentrations are available, such as behavioral studies, early childhood education, fine arts, and English. While many courses are entirely asynchronous, some may have a synchronous component. Before admission into the program, applicants must first complete their freshman year at UNC, including several education prerequisites. Successful applicants to UNC earn grades of A and B in high school and have ACT scores between 25 and 28 or new SAT scores between 1200 and 1310. Missouri students earning their bachelor’s degree in education online are trained to work with adult learners in a variety of settings, such as community colleges, professional and workplace development programs, and human resource training departments. The BES with an interdepartmental emphasis consists of 120 credits, 45 of which are general core requirements. The degree requires eight semesters to complete. This program is designed for both incoming freshmen and transfer students. The typical transfer student has already completed 63 college credits, but only 24 credits are required to submit materials as a transfer applicant. Transfer applicants should have a 2.5 cumulative GPA. Students may enroll for fall, spring, or summer semesters. Discounted tuition is available to Missouri residents. Graduates of Fort Hays’ affordable education degree online program are authorized to seek Kansas teaching licenses in elementary education. Licensure in other states may be possible, but prospective students should check their state’s requirements prior to applying. The BS in elementary education requires 127 credits: 55 credits of general core courses, 34 credits in the education major, 26 credits of professional studies, and 12 credits of student teaching. Additional internship opportunities are available. Both freshman and transfer students are welcome to apply. Transfer students over the age of 21 do not need to submit ACT or SAT scores. All students pay the same low tuition rate regardless of state residency. Online students may qualify for financial aid. Graduates with Regis’ affordable online teaching degree, the BA in elementary education with initial licensure, are licensed to educate Colorado students at the elementary level. The program requires 120 credits: 45 general core credits, 30 foundation education credits, 21 upper-level education credits, 21 professional sequence credits, and a three-credit elective. The professional sequence includes 10 credits of student teaching, which requires students to first pass the PLACE or PRAXIS exam. Applicants should submit high school and/or college transcripts. Transfer applicants should have at least a 2.5 cumulative GPA and may bring up to 75 credits from previous studies. Regis prefers applicants with three years of work experience. Applicants must also submit fingerprints and consent to a background check. Unlike other affordable online education degrees in elementary education, which focus only on kindergarten through sixth grade, the BA in elementary education from UAS prepares graduates for certification in teaching kindergarten through eighth grade. The 120-credit program is primarily designed for students who live in Juneau and Alaska’s rural areas. Although courses are offered online, a nine-month capstone student teaching experience is required. Students must maintain a 3.0 GPA and pass the Praxis Core/CASE or CBEST exams before completing the capstone. Applicants should have a high school diploma or GED and must submit transcripts and ACT or SAT scores. Transfer students must have completed 30 college credits and have maintained a 2.0 college GPA and a 2.5 high school GPA. ULM’s affordable online teaching degree prepares graduates to work in K–5 classrooms. The BS in elementary education consists of 120 credits, including major courses, general core requirements, professional and pedagogical studies, integrative studies, and student teaching. The program explores teaching methods and provides students with requisite knowledge of elementary school subjects, such as math, science, language arts, and social studies. Each student is assigned to a departmental advisor. Students take two or three classes per eight-week term. The program accepts freshman and transfer students. All applicants must submit college and/or high school transcripts. All students pay the same per-credit tuition rate, regardless of state residency. Based in Graceville, BCF offers two affordable online teaching degrees: the BA in elementary education and the BA in music education. The elementary education curriculum consists of 127 credits, with 33 general education credits and 61 major credits. As a Baptist institution, BCF also requires 18 credits of biblical and theological foundation courses. Although classes are delivered online, students must complete on-site student teaching experiences. The music education program requires 136 credits, including 85 major credits, 18 biblical credits, and 12 student teaching credits. Applicants must provide college and/or high school transcripts and must submit ACT or SAT scores, along with a letter of recommendation from a church or pastor. DU in Philadelphia offers an affordable education degree online program that leads to PK–4 certification. The BS in education is a part-time degree completion program for students with prior college credit. Graduates earn certification in PK–4 elementary or special education. The program requires 180 quarter credits, including general core requirements. The program’s education components may be completed in 10 terms spanning two and a half years. Students must maintain a 3.0 GPA. Students may bring up to 60 semester credits from previous studies. Applicants should have at least 24 college credits and a 2.5 GPA. Online students receive a 40% tuition discount over on-campus students, regardless of state residency. Located in Greenville, North Carolina, ECU offers two online education degrees: a BS in elementary education and a BS in middle grades education. Each program consists of 128 credits and leads to North Carolina A-level licensure. Education students complete 42 credits of general core and 25 credits of foundational education courses. However, students in the middle grades program take fewer specialty area courses, instead concentrating in two areas—English, general science, social studies, or math. Freshman applicants must have completed high school courses in English, science, and math. Transfer students should have earned at least 16 college credits with a minimum 2.5 GPA. Based in Winfield, Kansas, Southwestern College offers an affordable elementary education teaching degree online program; the 124-credit BA in elementary education consists primarily of education-related coursework, along with general core requirements. Although classes are offered online, students complete several on-site practicum and capstone student teaching experiences. Applicants must have at least six college credits, excluding AP courses, and a minimum 2.75 GPA, and Southwestern students must maintain that GPA to graduate. Students may earn transfer credit through prior studies, military work, or life experience. Only 30 degree credits must be earned through Southwestern, but 60 must have been earned through a bachelor’s degree-granting institution. Many students in Alaska’s rural areas earn their bachelor’s degree in education online from UAF. The BA in elementary education features an interdisciplinary curriculum that trains future educators in a range of academic areas. The program is designed with Alaska’s unique linguistic, cultural, and geographic identity in mind. Although courses are offered entirely online, students must complete a year-long on-site capstone student teaching experience. Students are admitted to the intern year separately. Applicants should have graduated from high school or received their GED and must submit ACT or SAT scores. Transfer applicants with fewer than 30 college credits should submit high school transcripts and standardized test scores. SUNY Empire State’s online teaching program is affordable and flexible. Offered as BA or BS in educational studies, the 124-credit program allows students to concentrate in areas such as adult education, educational psychology, lifelong learning, sociology of education, and teaching strategies. For added flexibility, students may choose to focus on multiple concentrations for an interdisciplinary approach. Although neither degree leads to teaching certification, graduates pursue careers such as teaching adults, community education, and workforce development. There are five enrollment dates throughout the year. Students may transfer up to 93 credits from previous studies. Discounted tuition is available to New York residents. Wilmington University in Newcastle, Delaware, offers a bachelor’s degree in education online program that trains graduates to work with multiple age groups. The BS in education studies offers four concentrations: early childhood education, elementary K–6, middle level grades 6–8, and skilled and technical science. The degree does not lead to licensure or certification. Except the middle grades program, which only requires 32 general core credits, students complete 41 to 48 general credits before beginning fine arts and social and behavioral science requirements. The skilled and technical science program concludes with a capstone. Freshmen applicants should submit high school transcripts or proof of GED. They may also submit SAT scores in lieu of completing skills assessments. Transfer applicants with fewer than 15 college credits must also submit high school transcripts. BSU’s online teaching program is geared toward elementary education and takes three years to complete. The BS in elementary education (also known as distributed learning in teacher education) meets the K–6 licensure requirements of Minnesota’s Board of Teaching. While designed for all Minnesota students, the program is especially advantageous for suburban and rural students who cannot attend on-campus classes. However, students do attend three on-campus sessions during the program. Applicants to the 63-credit degree completion program must have earned an associate degree, with a 3.0 cumulative GPA, and must submit ACT or SAT scores. All students pay the same affordable tuition rate, regardless of state residency. Union Institute’s affordable online teaching degrees prepare future elementary school and K–12 teachers. Both the BS in elementary education and BS in exceptional student education (K–12) are 120-credit hybrid programs. Students will need to complete some coursework in person at the Miami campus. The exceptional student program prepares graduates to work with students with learning disabilities and special needs, in both public and private school settings. Graduates of the program may also be qualified to work in institutions. Transfer students may bring up to 90 credits from previous studies. Union charges no application fee. Transfer applicants should submit all college transcripts. Chaminade’s affordable bachelor’s degree in education online program leads to Hawaii licensure in elementary education. The BS in elementary education is a uniquely hands-on program, with 74 credit hours dedicated to observation and participation service learning activities, which include more than student teaching. Students observe classroom management strategies, construct lesson plans in collaboration with experienced teachers, and work with individual students and full classes. Because this program reflects the history and culture of Hawaii, learners complete several pre-major requirements such as contemporary peoples of Hawaii and intercultural communications. Freshman applicants should submit high school transcripts and ACT or SAT scores. Transfer applicants must have a 2.0 cumulative GPA. Granite State offers several online teaching programs that lead to New Hampshire teaching certification: BA degrees in language arts, math, or social studies and a BS degree with early childhood certification. Students of the language arts program may earn certification in early childhood education, early childhood special education, elementary education, or general special education. The math program offers concentrations in elementary education, general special education, grades 5–8, grades 5–8 general special education, and grades 7–12. Applications are accepted on a rolling basis. Students may enroll in fall, spring, or summer. Applicants must have a high school diploma or GED. Granite State offers a special degree pathway for students holding an associate degree. New Hampshire residents receive discounted tuition rates. Western New Mexico University offers several online teaching programs, one of its most prominent being the four-tiered BS in elementary education, which prepares graduates to teach K–6. Students complete general education requirements, followed by major requirements, professional education courses, and a capstone teaching experience. Students must apply to field teaching experiences separately and should maintain a cumulative GPA of 2.75 to be considered. Per New Mexico regulations, students must pass three state-level assessments to advance through the program. Both freshman and transfer applicants must submit transcripts and ACT or SAT scores. New Mexico residents receive discounted tuition rates, and the university guarantees tuition rates will not be increased during a student’s education, provided he or she maintains a 2.0 GPA. Judson, a women’s college in Marion, Alabama, is known for offering affordable online teaching degrees aligned with Christian values. Students in the BS in elementary education program are encouraged to pursue student teaching service opportunities. Like other online education degree programs, Judson requires live teacher observation and hands-on teaching experiences, which total 15 credit hours. Graduates are eligible for Alabama teaching certification. Applicants must first be admitted into the educator preparation program, which includes 48 credits of general core and pre-elementary education requirements. Students must earn a 2.5 GPA in these studies and must pass written and oral interviews to proceed to the elementary education program. NU offers two affordable online teaching degrees: the BA in elementary education and the BA in English education. Both programs lead to Nevada teaching licensure, and graduates of the English program may work in middle and high schools. Both programs require 180 quarter credits, 76.5 of which must consist of upper-level courses. Students of either program must pass the PRAXIS exam prior to their studies. Applications are accepted on a rolling basis, and NU offers multiple start dates per year. Applicants should submit high school and/or college transcripts, along with standardized test scores. Transfer students are welcome, but a minimum of 45 quarter credits must be completed through NU. SMWC offers several online teaching degrees, which each lead to Indiana licensure. The BS programs include PK–12 art education, middle and secondary English education, elementary education with mild intervention, middle and secondary life sciences education, middle and secondary math education, PK–3 education with mild intervention, middle and secondary social studies education, and special education with mild intervention. Each program requires 120 credits, including general education requirements and 18 credits of education core classes. SMWC offers several start dates throughout the year. Applicants must submit an essay, transcripts, and letters of recommendation. In-state and out-of-state students pay the same affordable tuition rate, and military students receive a significant discount. Must offer a master's degree program in educational leadership, 100% online.